Ernst's Economy for you: Almost 60% of the current Dutch collective labour agreements has expired today, as many employers refuse to accept labour union FNV’s demands for a 3% wage increase. Here is why many Dutch companies should sign those CLA’s after all. Almost 60% of the current Dutch collective labour agreements has expired today, as many employers refuse to accept labour union FNV’s demands for a 3% wage increase. Here is why many Dutch companies should sign those CLA’s after all. It was a short message in the Dutch news today: “Almost 60% of the collective labour agreements (i.e. CLA or CAO in Dutch) has expired now, as many employers (organizations) refused to sign new collective labour agreements lately”. The main reason for this remarkable refusal: the labour union FNV has generally asked for a substantial wage increase of 3%, which is considered by many employers to be much too high. More than half of the approximately 900 collective labour agreements in The Netherlands has expired lately, without being replaced by a new CLA. This is disclosed by data of employer’s organization AWVN. Only 38 CLA’s were arranged during the months January, February and March of 2014. In ‘normal’ years, this number should have been around 100 for the first three months of the year, according to the organization. Dealbreaker for the employers (organizations) has been the wage increase of 3%, which has been demanded by the FNV labour union during most CLA negotiations this year. This was stated by a spokesman of the AWVN. “The labour unions want an advance on something that has not been realized yet”, according to this spokesman. “In order to get the economy at full speed, we need first strong and competitive companies. Only after that has been realized, the number of jobs AND the wages could increase. Something should be earned first, before it can be divided”. According to the AWVN, The Netherlands has a total of approximately 900 CLA’s. These CLA’s deal with the wages and fringe benefits of 5.4 million employees. This April 1st, already 518 CLA’s – for 2.8 million employees – have expired. There is, however, a very good reason for this. The Netherlands is famous for its ‘polder model’ of regular consultations between the employer’s organizations, the labour unions and the Dutch government. Due to this polder model, The Netherlands has not only been a country with very little labour strikes during the last three decades, but it also had a moderate wage development during the last thirty years. Some well-respected economists – including yours truly – are saying these days: ‘Perhaps a little too moderate…’. The initial reason for the polder model was simple: in the Eighties of last century, The Netherlands suffered from a situation of soaring inflation, soaring wages and (at the same time) stagnating productivity, aka ‘stagflation’. In order to break this devastating trend, all social partners (government, labour unions and employers) entered into the Wassenaar Agreement in 1982. This agreement dealt with the causes for the stagflation and brought a time of moderate wage growth. Due to this agreement, the economic situation in The Netherlands improved rapidly and over the years the country changed from a lagging economy into the ‘World Champion of Agricultural Produce and Exports’. Currently, The Netherlands is in the top ten of most competitive economies in the world, due to its wonderful physical and data infrastructure AND its competitive labour pricing. Besides that, the country with 16 million inhabitants is one of the largest exporting countries in the world and arguably the largest, if you look at the exports per capita. You can claim that the Dutch still earn very decent wages in general and that The Netherlands is one of the richest countries in Europe. And then you are totally right about that. Nevertheless, during roughly two-third of the last thirty years, there has been a situation of wage restraint. As a consequence, there has been very moderate wage growth of not more than 2.5% - 3% per annum in general (and often the percentage was much less). In a number of years during this period, the wage development was even well below the inflation percentage. This meant ‘de facto’ a wage decrease, instead of an increase. In other words: one can justifiably argue that the wage restraint has been maintained for an excessive period, which surpassed the initial and justified reasons for it. 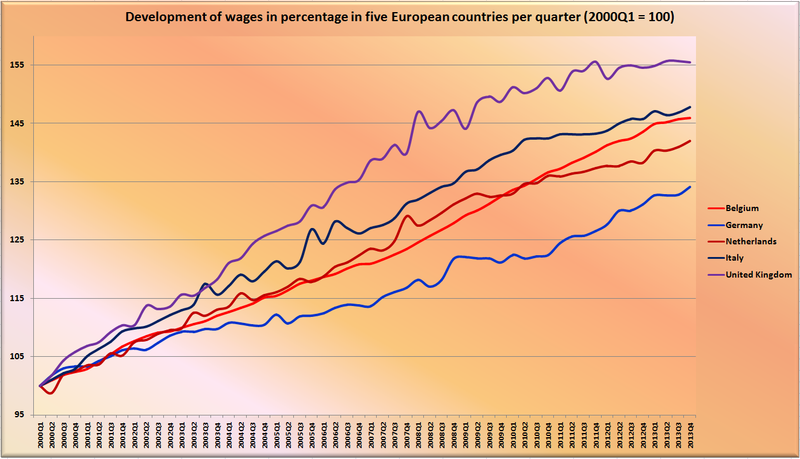 This becomes very clear in the following chart, which shows the indexed wage development since the year 2000 in five European countries, including The Netherlands and Germany. The only country, which endured more decisive wage restraint than The Netherlands during this time period, was Germany. Initially it made sense, as this country had to deal with the mindboggling expenses of the German unification and the dire economic situation of the former GDR. However, also Germany maintained the wage restraint policy for too long, in my humble opinion. It is no coincidence that Germany and The Netherlands are both the export champions of Europe and one should realize that these countries do it at the expense of the other Euro-zone countries; this is called "beggar thy neighbour". This excessive period of wage restraint in The Netherlands caused that the average Dutch worker didn’t profit sufficiently from the (excess) profits and large productivity improvements, which many companies made during the larger part of the last twenty years. So when the crisis started in 2008, most Dutch people had enough savings money to more or less maintain their normal consumption patterns. However, this changed when the second leg of the credit crisis started in 2011, due to the outbreak of the Euro-crisis. Then the collective eating into their capital of the Dutch middle-class and lower-class people and also the many years of wage restraint finally showed their undeniable influence on Dutch consumption. It is my humble opinion that this influence of wage restraint is the reason that the crisis and the economic decline have endured for such a long time in The Netherlands: much longer than in similar Euro-zone countries. During the last few years, the largest companies in The Netherlands – and also the companies which mainly exist from exports – already made very decent profits again. However, these companies categorically refused to hand over a fair share of these profits to their employees (in the form of decent wage increases), consultants and flex-workers (through higher remuneration fees). In my humble opinion, this had a devastating influence on Dutch consumption and on the profitability and viability of many small and medium enterprises (especially retailers), which had not been involved in the exports of products. Therefore I consider the statement of the AWVN spokesman (see red and bold text) to be full of ‘crocodile tears’ and blatantly false information. The labour union's (particularly the FNV) don’t want to have an advance on something that has not been realized yet. No, they just want to have a fair share of the 'lost' wage increases, during the last twenty years. And that is a whole different ball game. Of course, I don’t think that the labour unions should jeopardize companies that are in dire straits currently, as a consequence of this crisis. And I am convinced that the FNV won't do this at all. The union will undoubtedly reckon that it is better to have a job with less wages, than to be unemployed. Nevertheless, when a (large) employer already made a decent profit during the last few years and when it will probably remain doing so in the coming years, I think that a 3% wage increase is more than justified. Therefore these companies should sign those CLA’s without hesitation. They owe it to their loyal employees and to the Dutch economy.